Our bones are important parts of our body, and they are constantly changing and enduring stress. When stress from repetitive loads prevent the bone from being able to repair itself, cracks may begin to form. These cracks can develop into stress fractures, or cracks in the bone that result from repetitive force and/or overuse. The most common cause of a stress fractures is a sudden increase in the intensity and duration of physical activity. For example, if you begin to run long distances without working your way into doing so, you will be more likely to develop a stress fracture. Common symptoms of stress fractures include pain and swelling near the weight bearing area on the injured bone. When initial X-rays are performed, it is possible that the fracture will not appear. However, once the stress on the area continues, the damage will increase, and the fracture will eventually be severe enough to show up on an X-ray. Certain parts of the foot are more likely to develop stress fractures than others. Areas that are more likely to develop stress fractures include the metatarsals, the navicular bone, the calcaneus, tibia, and fibula. Since women are at an increased risk of developing osteoporosis, they are twice as likely as men to sustain a stress fracture. In addition, old age causes a decrease in bone mineral density, which is why elderly people are also likely to develop these fractures. It is important to be properly diagnosed for a stress fracture because there are other injuries that can easily be mistaken for a fracture. Sprains, strains, shin splints, plantar fasciitis, and Morton’s neuroma can all easily be mistaken for stress fractures in the foot. Dr. Legel will likely ask you a series of questions to determine what type of pain you are experiencing. These questions will help Dr. Legel identify whether you have a stress fracture. The best method of treatment for a stress fracture is rest. A walking boot, cast, or crutches may also help limit movement to the area that is injured. The typical healing time for stress fractures is 4-12 weeks; this depends, however, on which bone is involved. 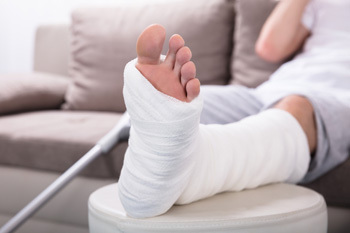 Dr. Legel is currently accepting new patients with stress fractures and other foot/ankle conditions. To schedule your visit, please call our Dallas clinic at (214) 366-4600. You may also us our online contact form located at the top of this page.